1. First, draw a front and bottom view by orthographic projection (fig. 2-51, view A). 2. Divide half the circumference of the circle (fig. 2-51, view A) into a number of equal parts. The parts should be small enough so that when straight lines are drawn on the development or layout between division points, they will approximate the length of the arc. Project lines from these points to the front view, as shown in figure 2-51, view B. These resulting parallel lines of the front view are called ELEMENTS. 3. Layoff the baseline, called the STRETCH-OUT LINE, of the development to the right of the front view, as shown in figure 2-51, view C.
Figure 2-51. - Development of a truncated cylinder. 4. Divide the stretch-outline into twice the number of equal parts equal to each division of the circumference on the half circle of the orthographic view (fig. 2-51, view C). 5. 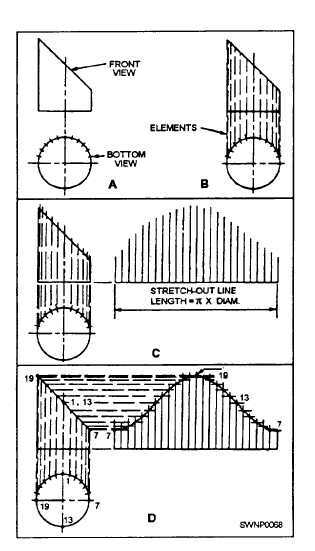 Erect perpendicular lines at each point, as shown in figure 2-51, view C.
6. Using a T-square edge, project the lengths of the elements on the front view to the development (fig. 2-51, View D). 7. Using a curve (french or other type), join the resulting points of intersection in a smooth curve. When the development is finished, add necessary allowances for warns and joints, then cut out your patterns. The radial line method of pattern development is used to develop patterns of objects that have a tapering form with lines converging at a common center. The radial line method is similar in some respects to the parallel line method. Evenly spaced reference lines are necessary in both of these methods. But, in parallel line development, the reference lines are parallel - like a picket fence. In radial line development, the reference lines radiate from the APEX of a cone - like the spokes of a wheel. The reference lines in parallel line development project horizontally. In radial line development, the reference lines are transferred from the front view to the development with the dividers. Developing a pattern for the frustum of a right cone is a typical practice project that will help you get the feel of the radial line method. You are familiar with the shape of a cone. A right cone is one that, if set big-side-down on a flat surface, would stand straight up. In other words, a centerline drawn from the point, or vertex, to the base line would form right angles with that line. The frustum of a cone is that part that remains after the point, or top, has been removed. The procedure for developing a frustum of a right cone is given below. Check each step of the procedure against the development shown in figure 2-52. 1. Draw a cone ABC with line ED cutting the cone in such a way that line ED is parallel to the base line BC. EDCB is called a frustum.